noun party: 1 a social gathering of invited guests, typically involving eating, drinking, and entertainment: an engagement party. 2 [a] a formally constituted political group, typically operating on a national basis, that contests elections and attempts to form or take part in a government: the party’s conservative mainstream. [b] a group of people taking part in a particular activity or trip, especially one for which they have been chosen: the fishing party. 3 [a] a person or people forming one side in an agreement or dispute: a contract between two parties. [b] informal a person, especially one with specified characteristics: will you help the party on line 2? ORIGIN Middle English (denoting a body of people united in opposition to others … (sense 2)): from Old French partie, based on Latin partiri ‘divide into parts’. … sense 1 … dates from the early 18th century. The sense developments here are complex and fascinating, but two senses stand out as by far the most frequent ones in current usage: sense 1, referring to a social event; and sense 2a, referring to a political faction. Then, each of these as the first, modifying, N in an N + N compound. Such compounds notoriously have many interpretations available to them, even if we restrict ourselves to subsective compounds (in which party linguist refers to a linguist) with an O-type (“ordinary”) semantic relationship between the two Ns (chosen from a relatively small set of such relationships: location, use, resemblance, agent/subject, patient/object, ec.). party-social linguist. A linguist at a party, a linguist who hosts a party, a linguist who’s the guest of honor at a party, a linguist who studies (social) parties, and so on. The sociolinguistics of party conversations is an especially interesting (though challenging) field of study. party-political linguist. A linguist who represents a party, a linguist employed (or otherwise used) by a party, a linguist who follows a party line, a linguist who studies political parties, and so on. The sense of the party linguist in the cartoon is pretty clearly that of the (sole) linguist employed by a party to serve its ends — in particular, to provide language (in speeches, press releases, advertisements, etc.) advancing the ends of the party. To put it nicely, to provide public relations for the party. To put it bluntly, to provide propaganda for the party and spin news reports in its favor. 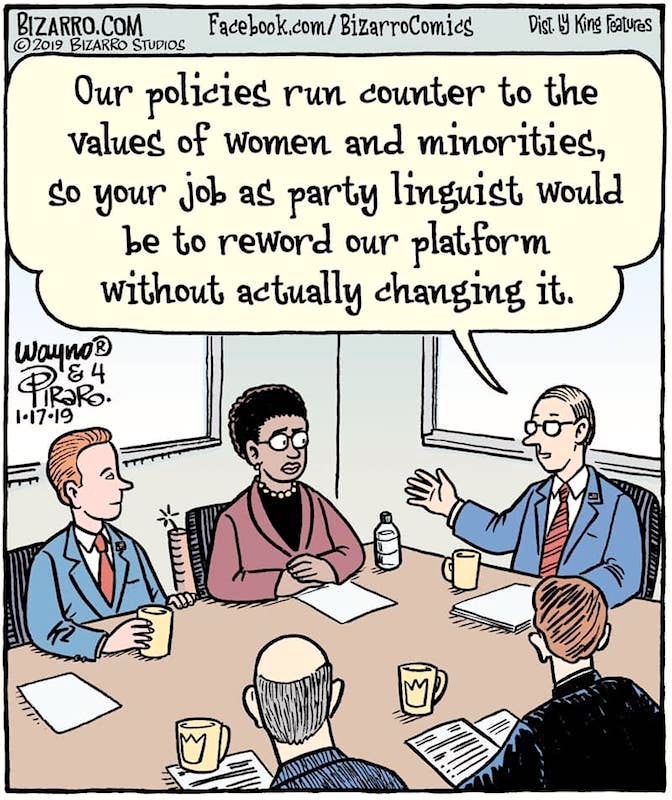 According to the speaker in the cartoon, the party’s record on women and minorities is flatly, unapologetically, appalling, so he’s directing the party linguist to create the illusion of some progress in supporting diversity (while changing nothing at all). Minorities and diversity. So of course the party linguist, chosen to shore up the party’s regrettable stance, is both female and black: the perfect diversity person. As an out gay person, I have served my time as an organizational diversity officer — mostly never able to decide whether these positions reflected genuine attempts to foster diversity or were merely pro forma obedience to administrative directives from Washington requiring that certain sorts of university activities had to have a diversity officer attached to them. Women, blacks, and out lgbt people were routinely tapped to fill these roles — adding an administrative responsibility to the stresses of personally coping with systemic prejudice. The strategy in the cartoon takes a big step past that, by callously exploiting a minority person as a pawn in a public relations campaign. How could anyone object to what the party linguist writes about the treatment of women and minorities, when the party linguist is both female and black? This entry was posted on January 28, 2019 at 8:34 pm and is filed under Ambiguity, Compounds, Gender and sexuality, Linguistics in the comics, Race and ethnicity, Understanding comics. You can follow any responses to this entry through the RSS 2.0 feed. You can leave a response, or trackback from your own site.